A proposal by New Hampshire and Vermont to offer their residents a voluntary paid family medical leave benefit has generated interest among private insurers, but not everyone is convinced the twin-state plan will bring more domestic tranquility. The effort by New Hampshire Gov. Chris Sununu and Vermont Gov. 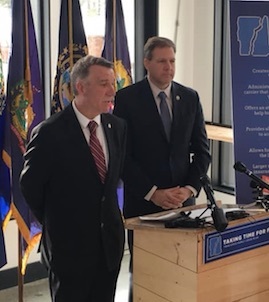 Phil Scott aims to shift the risk of insolvency to a private insurer rather than taxpayers while providing an expanded risk pool. Seven companies submitted requests for information about the plan this month, suggesting there’s a strong interest in the idea among experienced insurance carriers, according to a joint statement by the two states’ insurance commissioners. In January, Gov. Phil Scott appeared with New Hampshire Gov. Chris Sununu at the Schilling Beer Co. in Littleton, New Hampshire, to present a two-state paid family leave plan. The responding companies were Standard Insurance Co., Hartford Financial Services, Total Administrative Services Corp., ReedGroup, Anthem, MetLife and Sun Life Financial. The governors have proposed making the benefit available to the 18,500 state government workers in New Hampshire and Vermont, with the states picking up these employees’ premium costs. Other public and private employers in the states would be given the opportunity to participate, and the premium costs could be shared between employers and their employees. The benefit would amount to 60 percent of an employee’s weekly pay over a maximum time period of six weeks, according to a fact sheet on Vermont’s Web page. It could be used to provide parental leave after the birth of a baby, to recover from a major illness or to care for an ailing family member. “The goal of these programs is to increase access to all,” Kristin Smith, a research associate at the University of New Hampshire, told Watchdog.org. But Smith added that it’s not clear that a voluntary program would be sustainable. Those who expect to use the insurance, such as young couples who plan to start a family, will sign on, but others won’t, according to Smith, who has researched family and medical leave issues. The result is a more limited pool that could push up premium costs. “The cost is prohibitive for some to pay because you need a mixed risk pool in your program to share the costs,” said Smith, who expressed particular concern for low-wage workers. “It’s too costly for them to opt into the program,” she said, adding that no state has attempted a voluntary system before. The New Hampshire Senate just passed a mandatory paid family medical leave bill that would be financed by a 0.5 percent payroll tax and provide a maximum benefit of 12 weeks of paid time off. Mandatory programs have the potential to bring down overall premium costs, according to Smith. Another paid family leave bill, HB 628, which passed the New Hampshire House last year, would have required 43 additional state workers to launch the program, according to the governors’ fact sheet. The governors’ proposal requires just two new state employees, but millions of dollars would be required for the states to fund the benefit for all their state employees. The six-week time limit on the governors’ proposal falls short of more typical family leave programs, according to Smith. The time allowed to recover from a major illness is typically 20 weeks, while the American Academy of Pediatrics recommends 12 weeks to bond with a newborn, she said. A 2016 research paper co-authored by Smith indicates wide support for paid family leave in New Hampshire. “In a winter 2016 Granite State Poll, 82 percent of New Hampshire residents said they support a paid family and medical leave insurance program,” the paper says. Aparna Mathur, a resident scholar in economic policy at the American Enterprise Institute, said the effort by the two states is a positive development because state experimentation helps to determine what works and what doesn’t. But she agreed that the size of the pool of workers might not be large enough to fund the program, resulting in high costs or a breakdown. And the governors’ proposal for 60 percent wage replacements may not be enough to help low-wage workers, according to Mathur. Vanessa Brown Calder, a policy analyst at the Cato Institute, said a voluntary program would be better than a mandated, state-run program. “First, so-called ‘voluntary’ state paid leave policies are likely superior to paid leave policies mandated by government because they are less distortionary and preserve some choice,” Calder said in an email. But she questioned why states would need to contract with a private insurer to provide a voluntary paid leave benefit, since private firms can now sign agreements with insurers to provide their workers with coverage. “Moreover, individual employees can obtain their own individual short-term disability policies by contracting with private companies for coverage that covers pregnancy and maternity leaves,” Calder said. The demand for maternity benefits has increased to a point that employers are providing more of these types of paid leave benefits on their own, without government involvement, she said. “Given the many available private market options, it’s unclear what a government ‘voluntary’ paid leave policy adds, except perhaps scoring some political points,” Calder said. If it doesn’t have the potential to help every employee, doesn’t increase the tax burden, and not be a hardship on some employers, then it would be a failed plan. There lies the overwhelming problem of a well meaning idea.